‘Glasgow’s miles better’ was the campaign, started in 1983, which changed the way the world looked at the city. With the cartoon figure of Mr Happy associated with the phrase, it was hugely successful in turning around people’s perceptions. In 1990 Glasgow was named the European City of Culture giving it another opportunity to attract visitors who might otherwise prefer its east coast rival, Edinburgh. I am pleased to report that Mr Happy is alive and kicking in Glasgow. Within a few seconds of parking in the city centre, a smiling woman knocked on our car window to offer us the remainder of her ticket as she was about to leave. Elsewhere in the city the taxi drivers were helpful, waitresses were cheerful and the general public were keen to engage in conversation: laughing with us on escalators, in shops and museums. Other rooms were devoted to Charles Rennie Mackintosh and the Glasgow Style with some wonderful pieces from the famous Miss Cranston’s tearooms. On the first floor stunning paintings by Monet, Van Gogh, Gauguin and Rembrandt were on show, plus the quite awe-inspiring Christ of St John of the Cross by Salvador Dali. This is a museum to return to again and again, as I’m sure the residents of Glasgow do quite often. The story-telling and the relaxed, warm atmosphere, make this a big hit for families. 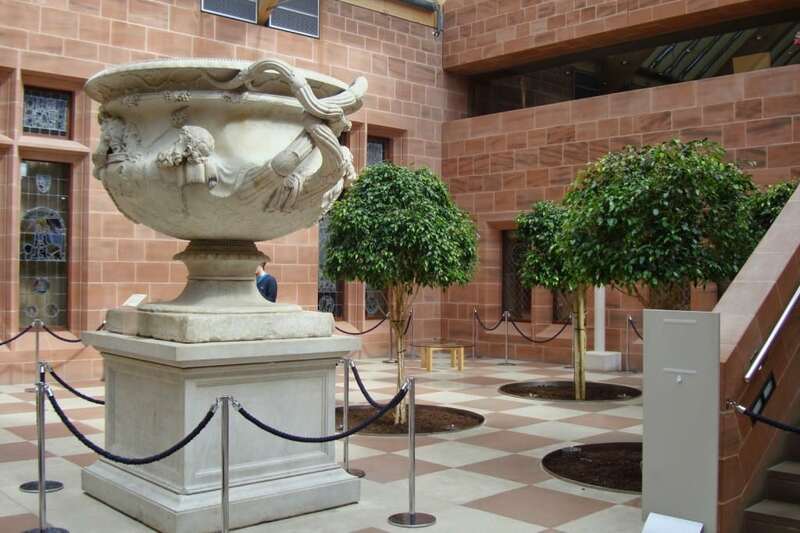 Courtyard of the Burrell Collection with the famous Warwick vase in the foreground. Another free museum with an impressive array of gathered treasures is the Burrell Collection, just south of the city centre in Pollok Country Park. A light, airy, contemporary building houses over 8000 objects donated by the shipping magnate, Sir William Burrell. He certainly had an eye for art as the collection has examples of Ancient Greek and Egyptian civilisations, Chinese and Islamic art and objects from Medieval Europe. Despite the fact that rain damage has closed the mezzanine floor, a selection of the paintings from that part of the museum have been moved downstairs to a temporary gallery: the ‘Bellini to Boudin’ exhibition has some exceptional paintings including works by Degas, Whistler and Cézanne. Dougie and Alex, best of pals. Galleried out, a little bit of modern culture was needed so we made our way to Hampden Park, home of Scotland’s national football team. The Hampden Experience includes a visit to the Scottish Football Museum plus a guided tour of the stadium: both well worth doing whether you’re a Scottish football fan or not. Dougie shed a tear looking at the Scottish Cup which his team, Hibernian, hasn’t won since 1902. The curators of the museum, a great bunch of knowledgeable blokes, gave him some ribbing about this. During the tour we tested out our shooting ability: Dougie nearly did his back in trying twice to get the fastest goal, Rory booted both of his over the bar and his girlfriend, Juliana, sent her shoe careering into the net. My own attempt was successful but rather daintily executed. Our tour guide, Pat, was a joy to listen to. Full of stories and gossip, he entertained us for a full hour with tales from Hampden’s history. The tour included the changing rooms (only three hair-dryers?) and, best of all, a walk onto the terraces to look at the pitch. Only there was no pitch. Hampden is being converted to an athletics stadium for the forthcoming Commonwealth Games. We weren’t allowed to take photographs of this, but an incredible feat of design and engineering, the ‘Glasgow Solution’, has created the world’s first 400m running track, 2m above the pitch, supported by 6000 steel stilts. Removing 8000 seats in the process, the work being done is mind-boggling but, with 100 days to go on the day we visited, it was looking very impressive. If you’re thinking of attending the Commonwealth Games in the summer then I can assure you Glasgow will welcome you with open arms. It is an upbeat, trendy city full of spirited, proud people. They were right to adopt Mr Happy in 1983 and they have made sure he has never left them. Look out for my next post about our accommodation: an amazing award-winning B&B. Trish’s Top Tip: Don’t miss the ‘Looking at Art’ room on the ground floor to unlock the secrets of paintings and see art in different ways. Trish’s Top Tip: Look out for Rodin’s The Thinker sculpture in the courtyard. For excellent soup and moreish cake, head to the café where the cheerful staff will welcome you. Help yourself to free glasses of water. Trish’s Top Tip: The tour is such a brilliant part of the experience, don’t miss out by just visiting the museum. Relax in the café, have a Costa Coffee and wait to be called. Ask your guide who is the most successful Scottish footballer; you’ll be surprised at the answer. I've not been to Glasgow but it sound like a great place to visit. The photo of the Hanging Heads is great. We loved Glasgow. Even Dougie, who was born and lived in Edinburgh and didn't know Glasgow very well at all, was captivated by it. Not as touristy as Edinburgh, you get to see the real Glaswegians who work in the shops and attractions. In Edinburgh, like London, there is far more of a mix of nationalities. Glasgow is my home town, and I'm glad you enjoyed it. 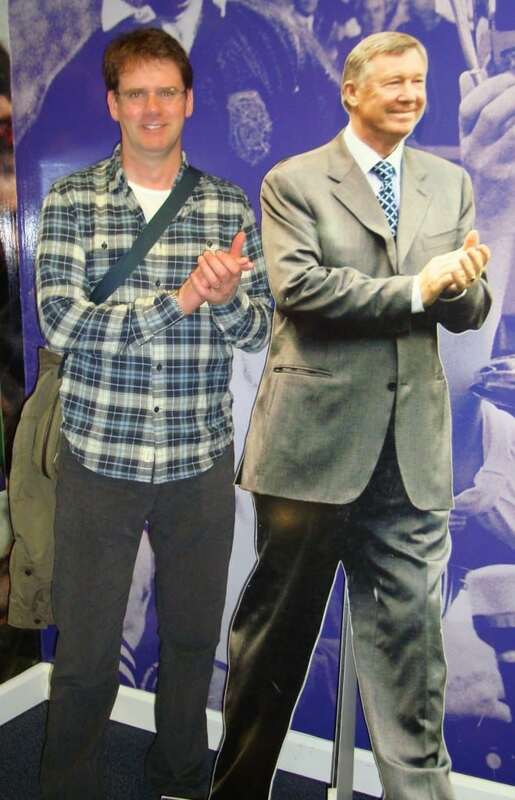 I've always found the people very friendly. I also love the Kelvingrove museum, there's hidden gems in some of these wee nooks. Hampden must have improved since my day. I've memories of torrents of urine pouring down the terracing during half time…didn't go very well with the Bovril and Scotch Pie. Ha! My husband has just laughed at your comment too. Similar memories from his childhood! So did you have to get Dougie to translate or was it close enough to Geordie to manage? And how did Rory do? Funny how we should do both cities just a week before you. The painting is quite something. My uncle and aunt used to have a print of it in their living room when I was little – used to scare me witless. I've always been proud of my Scottish heritage but any nation that can invent and name a "bollock dagger" is up there with the best of them. And to show it and label it in a museum too! So pleased you enjoyed the post. There was so much to say so I had to strike a balance, to just give you a flavour of the city without too much detail which would be boring, but enough to inform! I'm a Souter, so I liked the Mr Snooty "Edinburgh's slightly superior" campaign… though I agree there's a wealth of culture in Glasgow and those galleries are fab. Did it really say 'bollock dagger' or was that your interpretation? Did they sell them in the gift shop? It really did say bollock dagger. I did take a photo but it came out a bit blurred, probably because I was laughing. It came with its own scabbard too. Damn, didn't check the gift shop. I went to Glasgow for the first time last year. Didn't get further than the shops. That's bad isn't it?! Ha! Depends if you bought anything! We had an hour walking through town and the shops looked great but I was in sightseeing mode rather than shopping mode so probably missed some decent stuff. I've never been to Glasgow, in fact I've never been to Scotland – I should be ashamed of myself! What a very interesting trip you had, it all sounds wonderful, I love the Hanging Heads exhibit. No shame in not having been but it really is a gorgeous country. Whether you fancy mountains or cities, wild beaches or quaint villages, it's got the lot. Ah well you two will be experts! We wish we had had another day in Glasgow, there was so much more we would have liked to see -the Hunterian Museum, the Glasgow school of Art – more Rennie Mackintosh would have been great. As Edinburgh is a tourist destination, it wasn't easy to meet residents. So many different nationalities there – rather like London. Of course, Dougie is from Edinburgh and he is lovely!! I'm definitely organising a bus!! That first photo in particular is fabulous! Edinburgh has so much to offer and us a truly beautiful, historic city so I can appreciate it is a focus for visitors. Glasgow is a city to visit if you want to chill, eat well and enjoy some culture- a more relaxed vibe. 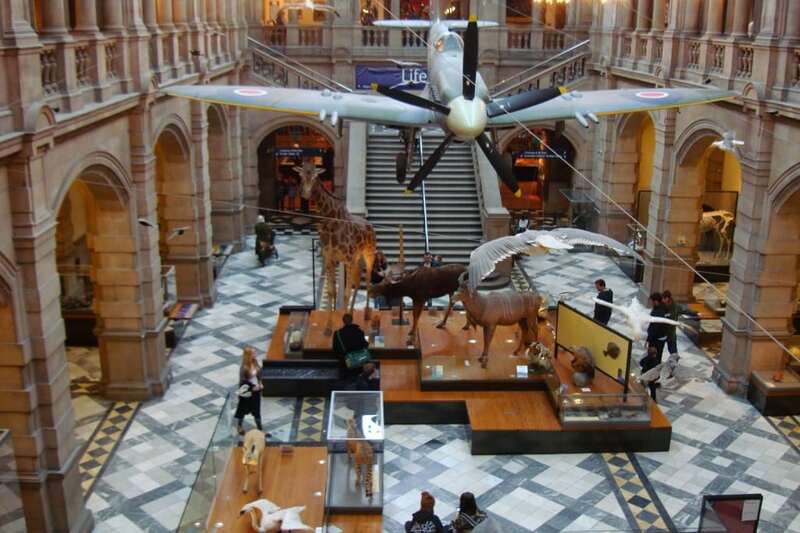 I loved the Kelvingrove! Did you get to go up to the Acropolis area? Glasgow was a far better experience for me than Edinburgh was, it deserves so much more attention. Great to be back on #citytripping! Glasgow was glorious – we loved it. Even my husband enjoyed it and he’s from Edinburgh! We didn’t get up to the Acropolis area but will next time as there’s sure to be another visit. I loved Glasgow when I visited a decade ago. I loved the architecture of the houses, the curries and the Rennie Mackintosh connections. I wish I’d had time to see the Burrell Collection. That’s always the problem with cities – often we have short breaks there and just can’t fit everything in. That should say NOT been to Glasgow (that will teach me to type and breastfeed at the same time)! Glasgow is such a big-hearted city. Great people, delicious food too. We had a fab meal at a restaurant with a brilliant name: The Ubiquitous Chip. I’m just back from two weekends in Glasgow on the trot – one with kids, one without. Lots of posts still to come. I love this city. And isn’t the weather fabulous right now. 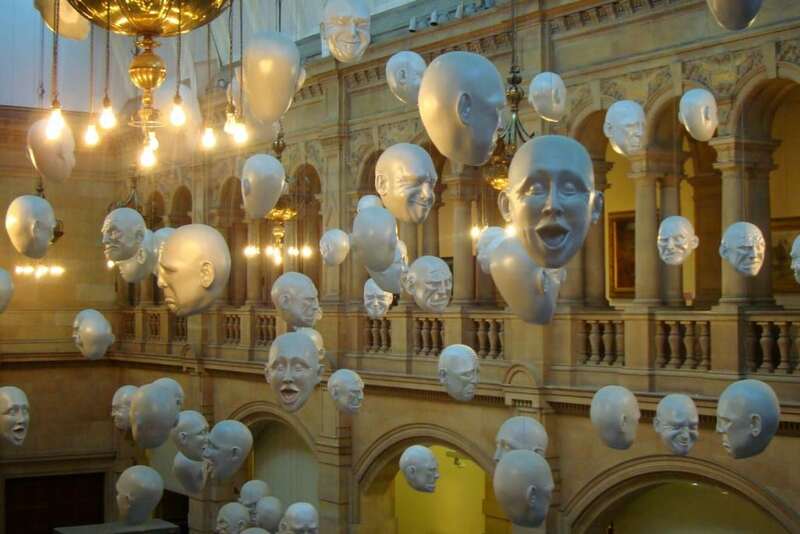 Can’t beat the heads in the Kelvingrove – so iconic. You lucky thing! Yes, it’s such a vibrant city – I need to go back soon. I had never been either – maybe because my husband is from Edinburgh and we always kept to the east of the country. You’re right – very family friendly. The Commonwealth Games were brilliant – from the bonkers Opening Ceremony onwards, they really showed the city in a great light.